A cocktail party is the perfect alternative to dinner and can be a little gathering or a large get together. It is also not as daunting as a dinner party if you still don't consider yourself comfortable enough to pull off a full meal. Between us, after my twenties, the thought of going to a bar was not my idea of a fun evening - so, cocktail parties! An edited group of friends plus an excellent playlist, drinks and a few good hors d'ouvres are all that is needed. It can be as grand or simple as you desire. The best part? Pretty much everything can be prepared in advance depending on your choices of recipes, giving you the freedom to entertain your guests and enjoy these moments together. Starting times vary between 6 pm and 7 pm usually and depending on its length, the quantity and nature of the hors d'ouvres should be taken into consideration as you might be substituting dinner. No seating arrangements are necessary as some of the best moments should happen while moving around the room and having the opportunity to chat with different guests - something that can be challenging during sit-down dinners. For a larger party, the most elegant way is to hire someone to take orders and serve drinks on a tray. In this manner, if you do not have a full bar set up at your house, it can be configured in the kitchen away from guest's sight. The glasses should be sparkling clean and no; plastic will not do. Research rental places in advance, be aware of their selection and typical lead time necessary for orders if the number of guests exceeds the number of glasses you have available. You will be surprised how affordable rentals can be. A signature cocktail depending on the season and your preferences is a fun way to start the evening off. Calculate roughly that each guest will drink two cocktails during the first hour and one cocktail for each hour after that. You can be adventurous here, choose a theme or particular cuisine. Why not a vegan or raw food idea? Since it is only bite-size, your guests might be more inclined to try something they would be cautious if ordering as a main course. The quantity varies, but it is better to be generous. Usually, for a two-hour cocktail party, six to eight varieties should be enough, calculating an average of two items of each kind per guest. Keep it at bite-size, eliminating the need for plates and utensils. Each tray should carry one kind of hors d'ouvres; it is much easier this way to decide if you would like that one or not without interfering with a great conversation. Make sure presentation is taken into account using beautiful trays or platters, lining them with banana leaves, grape leaves or other greenery or natural texture is usually easy enough. Flowers and cut fruits are an excellent addition to add color and interest to trays. Go ahead, organize a cocktail party for your friends, it is a fantastic opportunity to return invitations, solidify friendships and introduce new people. 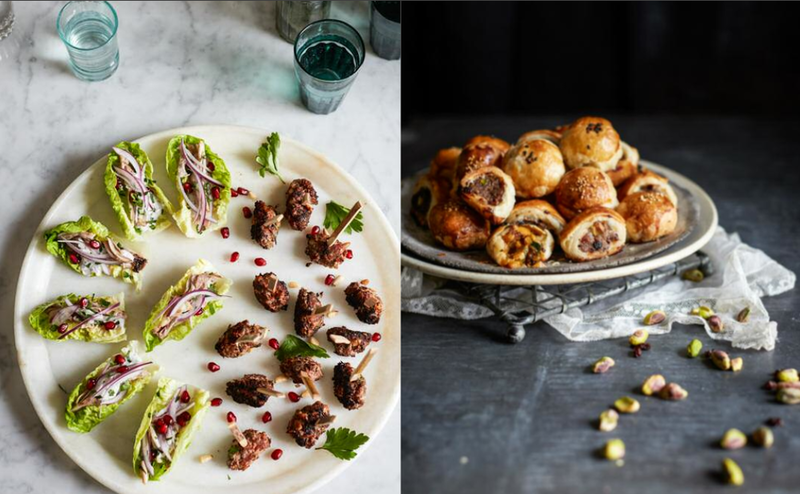 On the cookbook "Party-Perfect Bites", chef Milli Taylor has plenty of easy to make and delicious hors-d'ouvres options for your next gathering.